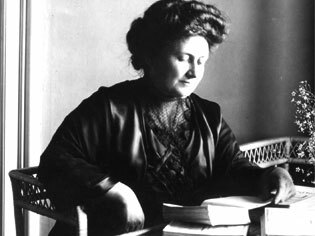 Born in Chiaravalle, Italy, Maria Montessori became Italy's first woman doctor. She graduated from the faculty of medicine at Rome University in 1896. After graduating she returned to the University to do research work at the psychiatric clinic. Children became her special interest. In 1900 she became Director of a school established by the National League for Retarded Children. She set about observing the children and designing teaching materials best suited to their needs. Previously, these children, who had been abandoned as incapable of learning, began to show the ability to care for themselves. Montessori later submitted these same children for the public examinations for normal children, with the astounding results that they achieved marks equal to or even above those gained by the normal school child in Italy at the time. 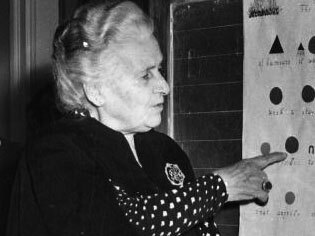 Montessori was so successful with her work for these children that she now became recognised as an educator rather than a physician. 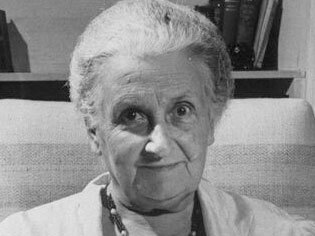 In 1907 Montessori had her first opportunity to work with normal children when her first Casa dei Bambini (Children's House) was opened in a tenement building in the San Lorenzo slums of Rome. Here the children were provided with a prepared environment and were invited to explore and choose their own work, thereby fostering their independence. Montessori was constantly experimenting, modifying and adapting her didactic material to suit the needs of the children. In 1909 the first Montessori Training Course was given. Private Montessori schools started being established in Europe. Montessori travelled extensively in the next few years giving lectures and training courses in England, Spain, Austria, Holland and the Americas. Her method was endorsed and financially backed by people such as Alexander Graham Bell, Thomas Edison, Sigmund Freud, Ghandi and Piaget. 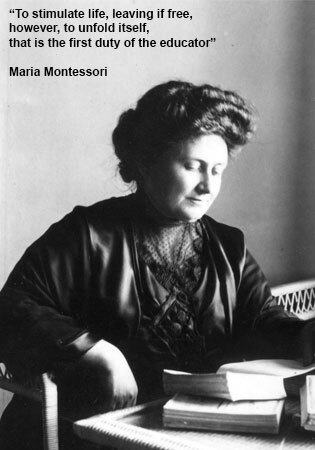 In 1934 friction arose between Montessori and Mussolini and when all her schools were closed in Germany and Italy by 1936, Montessori left Italy for Spain. Her stay there was cut short with the outbreak of the Spanish Civil War. She then fled to England. 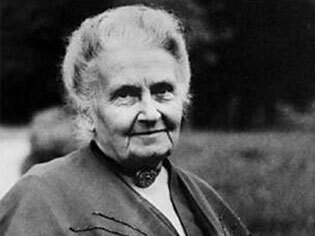 In 1939, at the age of 69, she arrived in India to establish a Montessori Training Centre. She was interned during the war years as an Italian National, but was given special permission to continue her work. These war years caused Montessori to pursue a passionate quest for lasting peace through education. She was nominated three times for the Nobel Peace Prize and in 1950 she became the Italian delegate to UNESCO. She died shortly before her 82nd birthday on May 6th 1952 in Holland.